Jen Bekman believes that everyone should live with art. In fact, she ditched the corporate life to open her own little art gallery on Manhattan’s Lower East Side in 2003. But that wouldn't make art accessible to everyone, so in 2007 she expanded to create 20x200, a way to shop real, carefully curated art via the Internet. It’s simple: (limited editions × low prices) + the internet = art for everyone. The name comes from the fact that these limited edition pieces start at just $20 apiece, making – Jen hopes – real art affordable for everyone. It’s easy and convenient for customers, and it offers great exposure for the creators. 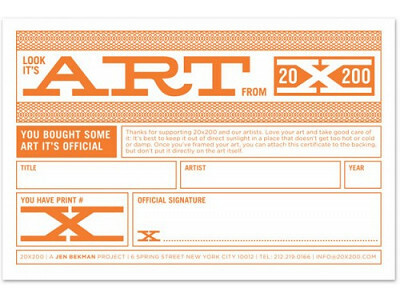 When you shop at 20x200, you're directly supporting the artists, who receive half the revenues of each sale. New editions are introduced every two weeks (one photo and one work on paper), so check back often. Jen says that homes filled with art are happier, and supporting artists is good for society as a whole. Thanks to evolving technology and her ingenuity, now everyone can get in on her vision. Are you ready to become an art collector? economy that allows more artists to make a living by making art. you’re directly supporting the artist who created the work. questions, please let me know here. @Mary Kerran: It's a great win-win and way for an artist to make money doing what they love to do. We're glad you connected with this story. I don't think you do the business justice by saying that artists get "50% of the profits." It's not till you click through that you see that they get 50% of the retail, which is much more meaningful. Splitting 50% of nonexistent profits would not be impressive! @Robin Wolaner: Artists do get half of revenues from the sale of their prints on 20x200. There are few things that give me greater pleasure than writing fat checks to artists and as the business gains momentum, that's something I get to do with increasing frequency. @Robin Wolaner: Thank you for catching what all of our eyes didn't! @Katherine Klinger: glad to help ...once an editor, always an editor! side note, i noticed one of the pieces of artwork flashed in the video(awesome photo of men in flashy-colored pants) was shot by an old friend from UVA....super cool dude Landon Nordeman: http://www.20x200.com/artists/landon-nordeman.html Crazy talent. I remember going to one of his photography exhibits...in an UVA architecture classroom....1997. @Liz B.: What a great story, thanks for sharing! @Liz B.: We love hearing stories like yours and giving collectors the opportunity to connect, or re-connect with artists they've known or admired. And, if you want another way to stay connected to the art world, sign up for our twice-weekly newsletter here: http://www.20x200.com/mailinglist/. It's where we introduce new artists + editions and share their stories. This is just what I've been looking for! We are in the process of adopting our 16 year old foster daughter & we re-decorated our office to become her bedroom. We haven't been able to find any artwork for her walls...yet! I know we'll find something at 20x200 ~ great prices, selections, and REAL art! What's not to love?? What a momentous occasion. Congratulations! Enjoy illuminating the walls of her new room. By coincidence, I discovered 20x20 on my own last week, and bought a print. I was coveting others, and so this offer today from Daily Grommet has made me very happy! Just splurged on 2 more, and this time saved $180! Fabulous company. I've been a fan for several years. How does all this work if you had some photo art that you would like to if someone would be interested in purchasing? How would I go about that? @Gary: Photography is typically curated and selected by the 20x200 team. However, they do have a semi-annual competition called Hey Hot Shot! to identify up-and-coming artists. You can sign up for their mailing list to stay up to date and make sure you get information about their upcoming 2011 competition. Good luck if you decide to enter - and be sure to let us know how it goes! Jen Bekman believes that everyone should live with art. In fact, she ditched the corporate life to open her own little art gallery on Manhattan’s Lower East Side in 2003. But that wouldn't make art accessible to everyone, so in 2007 she expanded to create 20x200, a way to shop real, carefully curated art via the Internet. It’s simple: (limited editions × low prices) + the internet = art for everyone. The name comes from the fact that these limited edition pieces start at just $20 apiece, making – Jen hopes – real art affordable for everyone. It’s easy and convenient for customers, and it offers great exposure for the creators. 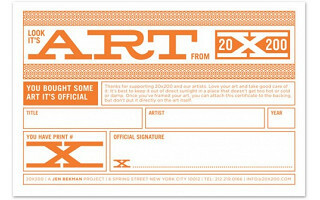 When you shop at 20x200, you're directly supporting the artists, who receive half the revenues of each sale. New editions are introduced every two weeks (one photo and one work on paper), so check back often.